This question is often tossed around and I've never really had a good answer. I mean if we're talking about dead people then there are quite a few who interest me (maybe a topic for another post), but when considering only the living (and eliminating all my 'on-line' friends as that's cheating) I struggle. But not any more. Sunday night I watched '60 Minutes' - something I don't normally watch - they had an interview with the latest Victoria Cross recipient - Corporal Ben Roberts-Smith. What a NICE GUY! He was seriously impressive in the interview - he came across as a real genuine Aussie who believes in what he is doing and doesn't shirk from what he considers to be his duty. Sir, you are welcome at my dinner table any time you like and bring your gorgeous family too! What about you, who would you like to invite to dinner? (Let's limit it to currently living people). After my long phone calls yesterday I decided to email the airline on their customer support email asking the same question so that if I did decide to bring back the mag I would have something in writing. "Hi, I'm booked to fly from Brisbane to Perth next week and I would like to pack a magazine for a pistol in my checked luggage. Are there any requirements that I need to fulfil to do this? Please advise." When checking-in firearms and ammunition, we recommend that you plan to be at the airport early, so that your check-in can go as smoothly as possible. To ensure you do not encounter anything that you were not aware of in your travels, please read through the below information so that you are fully aware of the travel requirements you will have to adhere to. *       You will be required to make written or verbal declaration at the time of check-in advising that the firearms are unloaded and suitably packed for carriage. You are permitted to carry both the firearms and ammunition within one case, as long as they are separated by some form of partition. Firearms and ammunition are considered as "Restricted Items", therefore after you have completed check-in for your flight, they will have a "Restricted Items" tag attached which will have to be signed by yourself. A description of the item and your flight details will be recorded on this tag and attached to the items. A perforated section will also be attached to your boarding pass and the items will then need to be transferred to the baggage sorting room by hand. These items will not be placed on the baggage carousel at any time for safety & security reasons, and must be signed for and collected from the oversized baggage counter. It is important that you keep your boarding pass with the perforated restricted items tag attached until the items are collected, otherwise the items will not be released. If your boarding pass is misplaced then you will be required to quote the reservation number in order to claim your restricted items. I hope this information has helped. For further clarification on this matter or any other queries, please don't hesitate to email us again or call our Guest Contact Centre on the number listed below." Not sure if this actually answers the question. Does the magazine have to be in a separately locked box in my locked luggage? I'm thinking having it posted is going to be easier. PS Just found out the magazine costs less than $35USD in the States, might see how difficult it is to import a couple. I want to get another 10round mag for my Springfield 9mm. My other 10 round mags are Chip McCormack 38super mags and they work just fine. 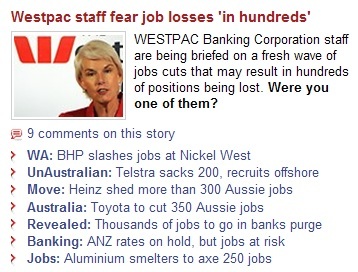 They were ordered from a shop in Brisbane a couple of years back. I emailed the store to check that they have them - they do; I also asked what paperwork I needed to purchase it - none apparently; and if they knew whether I could fly back with it - they suggested I ring the airline. I check the airline's on-line page. They say that they will allow the transportation of firearms and ammunition under some circumstances and to phone the service centre for details. AW (Airline woman): "How can I help you?" Me: "I would like to know if I can pack a magazine for a pistol in my checked luggage when I fly from Brisbane to Perth next week"
AW: "Can I have your booking number?" Me: "I don't have it handy, I just need to know if I can pack a magazine for a pistol in my checked luggage." AW: "You want to pack a gun in your luggage?" Me: "No just a magazine - a gun part." AW: "When did you book your flight? Did you pay for it by a credit card?" Me: "I didn't, the company that I will be working for did and I don't have any details with me, I just need to know if I can pack a magazine for a pistol in my checked luggage." AW: "A magazine for a pistol. Is that a gun or ammunition?" Me: "It's the magazine that goes into a gun that holds the ammunition." Me: "No, it's a part of the gun that holds the ammunition." AW: "What's your surname? Let me see if I can find your booking." Me: "I'm not sure what name it would have been booked in." AW: "Please hold I will see if I can find your booking". Me: "Actually I can't hold I'm late for a meeting. I will call back." New AW: "How can I help you?" AW: "Can I have your booking reference please." Me: "I'm sorry I don't have those details to hand I just need to know if I can pack a magazine for a pistol in my checked luggage." AW: "You have a booking?" Me: "Yes, well I think so, the company I am going to work for are organising that." AW: "The flight is a domestic one?" Me: "Yes from Brisbane to Perth." AW: "Please hold I will need to check"
AW: "Sorry for the delay we haven't had customers wanting to pack just a magazine for a gun before we need to find out. Please hold." AW: "How many magazines are you wanting to travel with?" AW: "Will it be loaded?" AW: "Sorry for the delay, yes you can pack it in your checked luggage. You will need to take your luggage to a service agent at the airport and declare it." Me: "Thank you. So I just pack it in the bag and take it to a service desk at the airport. Do I need to fill in any forms or anything?" AW: "You will need to complete a declaration form. They have them at the airport." OMG!!!! Seriously are you telling me that NO ONE has ever asked the question before? I am now very very nervous about how the conversation at the airport will go ... Maybe it will be easier just to get the shop to post it! Me: "Can you put the kettle on for me." Me: "Do you need help?" Miss 8: "No, I'm perfectly fine ... I'll tell Dad if I need help, I don't want to disturb you watching 'My Kitchen Rules'." The rules are : "I will write down five things that indicate to me that a gun owner or shooter maybe is an honest one. 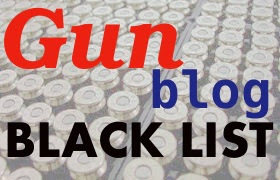 Then I will tag five other gun owners who are also bloggers and I hope will participate." Honest gun owner or shooter? I'm not sure whether it's because there aren't that many gun owners around or whether or not we don't have the 'gun shows' but I've never actually had to ask myself is this person an 'honest gun owner/shooter?'. 1. They handle guns safely AT ALL TIMES. All four rules are strictly followed AND they practise the "alcohol and guns don't mix" maxim. They also clean up after themselves on the range. 2. They can discuss various aspects of guns rationally. They acknowledge that their favourite gun / ammo / caliber / make isn't the only one in existence and may actually not be the best. 3. They are polite to newbies and let them have a go with their guns after explaining clearly how to hold the gun and how much recoil to expect. 4. They don't assume all women are idiots who only like pink guns! 5. They're willing to pay their way on shooting trips and return invites when they can. Who to tag that hasn't been tagged yet? Bob over at The Drawn Cutlass. Barron at The Minute Men. and FarmDad at Looking out over the South Section. The club committee has decided that Wednesday shoots no longer count as an "attendance" for the purposes of gun support :( So I now have to shoot on either a Saturday afternoon or Sunday morning. So today Shooting Buddy and I decided to head up for the Saturday afternoon shoot. We were pleased to see that the range wasn't crowded out (it can get busy on weekend shoots). We ended up squading with the other Wednesday Captain, four ex-students (well three for me, 5 for Shooting Buddy) and one other guy. (Total of 8 people). The other squad also had 8 or 9 people. There were four stages set up all were fun to shoot, however the last stage we shot was the best. There were 6 targets to be taken from the first shooting position, one target through a portal, two off to the other side of the range and then a set of stairs and platform with three targets visible AND a flying fox target!!! Apart from having two jams :( it was a really fun shoot! Most of us emptied the mag on the flying fox! Oh and the weather was "just right" for shooting (about 26C with a gentle breeze). If all the shoots on Saturday are like this maybe it won't be so bad. Yes, that is what I've been doing! On Saturday I drove up to Shooting Buddy's place (400kms north) and after a cuppa or two we had a chat about what we were going to do that evening. I suddenly remembered that the local Shotgun club meet on the third Saturday of the month, and as this was the third Saturday of the month we might be in luck. Shooting Buddy gave the secretary a call only to be told that there was no shooting on that night. Half an hour later he rang back to say that actually there was going to be some shooting on, commencing at 7.30pm. So we heading across, sans guns - as Shooting Buddy's shotgun was still in storage in Perth - and got there about 7pm. The gate was open and the lights were on but we couldn't spot any people. So we parked in something that looked like a car park and waited. Another four wheel drive turned up and we introduced ourselves to the occupants only to discover that they too were visitors and had no idea of anything either. Eventually we located some club members (they had been down at the range setting up) and after chatting for about 45mins (and troubleshooting one of the traps) the shoot was going to start. I've not shot trap much before - couple of tries but never a match and never at night. However, one of the club members had a Beretta over and under 12GA shotgun that he was willing to lend me (and a shooting vest), he found me 100 shotgun shells so I thought I would give it a go. Now, to set the scene, we're in the middle of salt lakes, at night, abit with lights, HIGH WIND and fluro traps being flung at high speed from FIVE different directions. Add to this FIVE shooting positions (you shoot at five clays from each shooting position). So all-in-all I sucked! Seriously! From the first 25 traps I got ONE. I did improve greatly by the second 25 when I got 5! However, it was at this point that I decided to gracefully bow out. I had shot 70 rounds and my shoulder was KILLING ME! So I just sat back (well stood - there weren't any seats) and observed the other shooters finishing off the match. It was a lot of fun - even though I was so hopeless at it - so much fun in fact that I joined the club. I guess now I'll probably need to get a shotgun! We left the club at about 10pm and decided that rather than return home and crash we'ld go out to the farm and see what animals were out and about. The farm was only 30kms up the road so not far. We had just pulled in the gate, got the spotlight set up and the guns organised when we spotted a large rabbit ... I got it! We then drove around and spotted 4 foxes - but they were all too far away to shoot at - then we came across another large rabbit - so took that one too. Another fox was spotted, which I actually took a shot at, but missed :( As it was now after midnight we decided to call it a night and head home. I'm looking forward to getting back out there and getting some of those foxes! Sunday morning saw us up relatively early to head to another gun club - pistol this time. The club shoots WAPA style shooting - standing still, 25m from the target and shooting 5 rounds in 5 mins!?! You repeat this four times. Not sure what was wrong with me (maybe a sore shoulder?) but I seriously sucked at this too! There were only three of us shooting and I came third! But it was good to get the pistol out and have a go. It was then time to head back to Perth to put the guns back in the safe. However, today at work I was surprised to see one of our branch managers there. We've spoken about shooting before but the timing has never worked. However, today when I asked him if he wanted to come up the range after work he was really interested. Logistics was a bit of a challenge as Shooting Buddy had come back to Perth with me and had my car and of course my guns were at home etc etc. Anyway managed to short the issues out and ended up at the range at around 5pm. He had never shot before - never even seen a real live gun - so we started with my Ruger 22/45, progressed to my 9mm and then another member who was up there practising let him have a go of his .38 race gun! ... And he also demoed a IPSC style stage to the newbie. I then brought the Tuffy out (.410) and he LOVED that. So much so that he shot off most of a box of ammo (I think he'll be another one with a sore shoulder tomorrow). He then finished off the 80 rounds of 9mm ammo I had and the 80 rounds of .22. I think he had fun! So now I've got to do some gun cleaning and reloading in preparation for heading to the range again on Friday for some seriously needed practise! Miss 10 has a habit of reading a book from beginning to end and then complaining she has nothing to read. Miss 10: "I get in trouble at school because I don't read at nights." Me: "Well get a book and read to me." Miss 10: "I've finished all my books." Me: "Have a look in the box in the family room and see if there is anything you want to read in there." Miss 10 turns up with the book "Eats, Shites and Leaves Crap English and how to use it" by A. Parody. Well, I'm not sure that it's a suitable 'school reading book', however she read the first couple of pages and LOVED it. It's a great book. She would read a sentence and then we would discuss it. So I've written that she read 4 pages in her homework diary. We then had a bit of a wrestling match as she wanted to take the book to read in bed. Yer, right ... next thing you know she'll be up all night reading and the book will be finished! So I ended up locking it in the safe and promising her that she can read another 4 pages tomorrow! AN undercover cop "chased himself round the streets" for 20 minutes in a town in southern England after a surveillance camera operator wrongly identified him as a suspect. The junior officer was patrolling the area by foot, after a rash of burglaries, when a CCTV operator radioed him, warning of a man "acting suspiciously" in the vicinity, according to the latest issue of the Police Federation's Police magazine. Monitoring the "suspect," the operator then directed the cop to the man's location. The officer - not realising that he was the "suspicious" character - began searching for his shadowy suspect. The fruitless pursuit ended 20 minutes later when a sergeant entered the CCTV control room and pointed out that the cop and the suspect were the same person. "Every time the man darted in to another side alleyway, the PC [police constable] was turning immediately into the same alleyway, but every time the CCTV operator asked what he could see there was no trace," an officer, who was not named, told Police magazine. "With the sergeant's sides aching from laughter he pointed out to the PC that the operator had been watching him unaware that he was a plainclothes officer - thus the PC had been chasing himself round the streets." None of the parties involved in the incident were identified. A Sussex Police spokesman told the (London) Daily Telegraph "without the date or location, confirming the details and locating the officer is harder for us than it was for the CCTV operator." 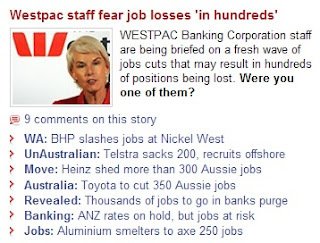 This is a snapshot of the business section of www.perthnow.com.au earlier today. Doesn't paint a pretty picture does it?